Raymor has a comprehensive range of Warranties for all Raymor products. For your continued peace of mind, all Raymor showers carry a 5 YEAR WARRANTY from date of purchase, providing they are installed according to Raymor assembly instructions by a professional shower installer. For your continued peace of mind, all Raymor basins carry a 5 year warranty on vitreous china from date of purchase, providing they are installed according to our specification by a licensed plumber. For your continued piece of mind, all Raymor vanities carry a 5 year warranty from date of purchase, providing they are installed according to our specifications by a licensed plumber or builder. Raymor will replace this product if a fault is shown to be caused by faulty manufacturing or materials, prior to correct installation. This guarantee does not include removal and installation costs. Raymor will, within the above warranty periods from invoice date and subject to proof of any faulty workmanship or material, at its option repair or replace the faulty product to Raymor’s satisfaction. This guarantee is limited to the replacement of defective parts only. Labour charges and/or damage incurred in installation, repair or consequential damage, or otherwise suffered or incurred by any such person are excluded from guarantee. For your continued peace of mind, all Raymor accessories carry a 5 year warranty from date of purchase, providing they are installed according to our specification. 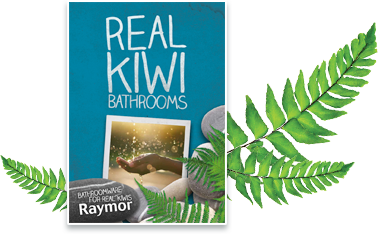 All Raymor toilets carry a 2 YEAR WARRANTY for fittings, one year warranty on seats and a 5 YEAR WARRANTY on vitreous china from date of purchase, providing they are installed according to our specification by a licensed plumber. 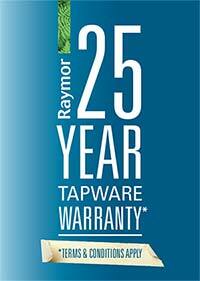 For your continued peace of mind, all Raymor laundry tubs carry a 5 year warranty on the cabinet and taps and a 25 year warranty on the laundry bowl, from date of purchase. Products are to be installed according to our specifications by a licensed plumber or builder. Raymor will replace this product if a fault is shown to be caused by faulty manufacturing or materials, prior to correct installation. This guarantee does not include removal and installation costs. The guarantee is non-transferable and proof of purchase is required. If spray or abrasive cleaners are used on the powder coated cabinet, it will void the warranty. (The cabinet should only be cleaned with mild detergent on a soft damp cloth). Failure to use an in-line strainer or filter on the mixer may also void the warranty. Pressure limiting is recommended above 600kpa and should never exceed 1,000 kpa.